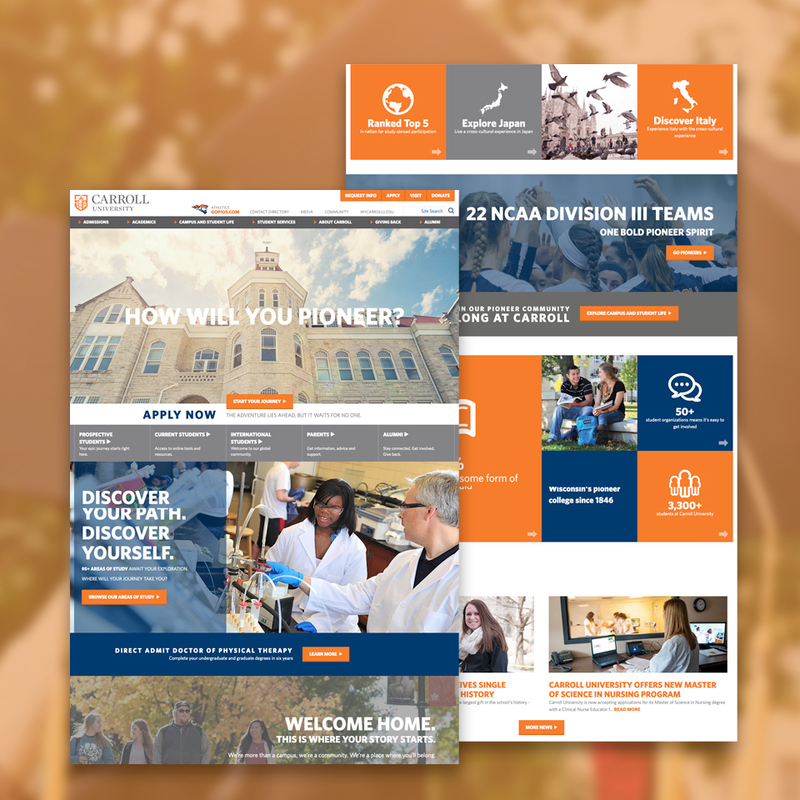 Carroll University, a private liberal arts university in Wisconsin, needed a website to drive enrollment, support current students and boost alumni engagement. Ascedia delivered an award-winning website that boosted Carroll's numbers. Find out more. 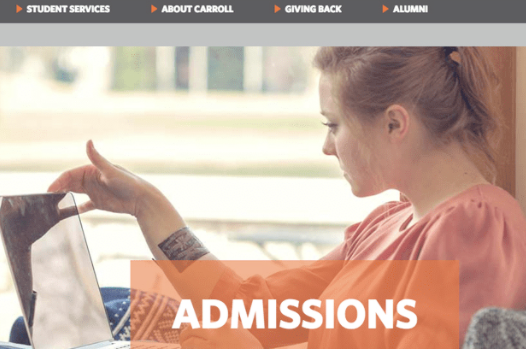 Despite having three clear target audiences (prospective students, current students, and alumni), Carroll did not have clear website user journeys for each group. They had an overwhelming volume of content, and visitors would get lost in a maze of links with no way to navigate back. Carroll also struggled with website management. Different departments owned and managed their own content, which resulted in a disparate brand experience across the site. Lastly, they needed a way to capture leads in a single system. With UX consulting, we defined user personas and organized all of Carroll’s web content into clear user journeys. To ensure visitors were only served relevant information (and not going down a content rabbit hole) we developed navigational paths based on the persona accessing the website, starting with the home page which clearly labeled each persona’s starting point. 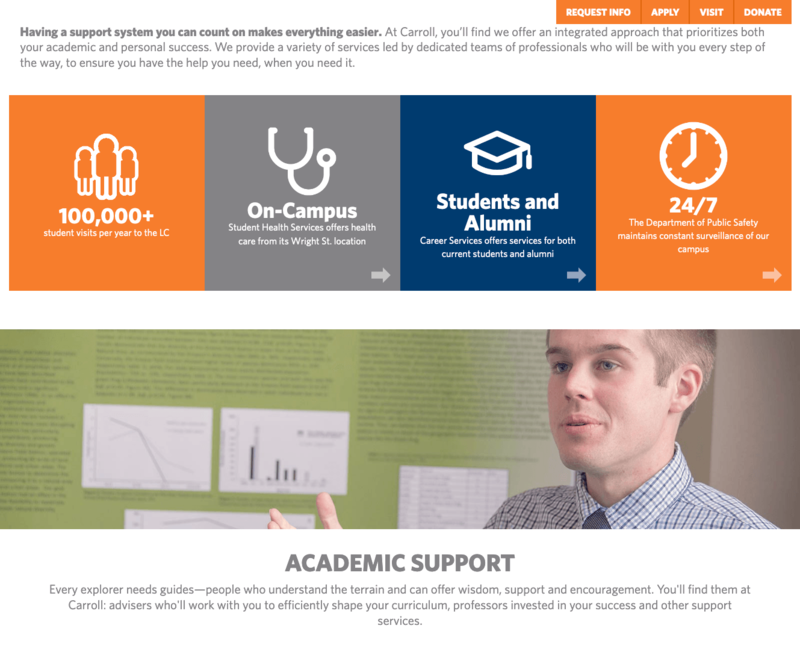 Knowing that Carroll had multiple web administrators, moved them to Kentico EMS for its intuitive and customizable features. Every administrator could drag and drop templated widgets to build new pages. This preserves their branding and user experience across the website. Kentico EMS also easily integrated with third-party tools that administrators wanted to continue using. We developed the site according to WCAG AA Compliance standards, which was paramount in the higher education industry. At the end of the project, we provided Carroll's marketing team with a comprehensive training guide for new users and tips to troubleshoot common issues.